Thank you, Tasha Saecker, librarian and author of the blog wakingbraincells.com for this comment in her review of The First Step: This book demonstrates many things to young readers. First that they themselves can create change in the world around them. Second that a loss does not mean the end, it means the fight continues in a different way. I hope my book can stimulate discussion at home and school about all sorts of things: race relations, justice, and encouraging kids to speak out about things that matter to them. This page will record ideas from teachers and parents (and, hopefully, from kids themselves!) about how they’ve used the book. Anyone who has a story to add, please contact me. Let’s start with some superb suggestions from The Classroom Bookshelf, a School Library Journal blog that explores exciting ways to use books in K-8 classrooms across the curriculum. The First Step was a relatable, thought-provoking story for my second graders. I read the book aloud, providing background knowledge on the history of segregation in the US while I did. They were appalled that adults would stop a child who was “just trying to get her education” from going to school. The writing challenged my students, yet kept them engaged and curious. And they were fascinated by the beautiful illustrations! Next we watched an animated video of Dr. Seuss’s The Sneetches, then they participated in a Socratic Seminar discussing the stories’ similarities. I challenged them to figure out each book’s central message. They had an amazing discussion about bullying, discrimination, differences and acceptance. They decided that the authors wanted us to know that it didn’t matter what you looked like and that everyone should be treated equally. 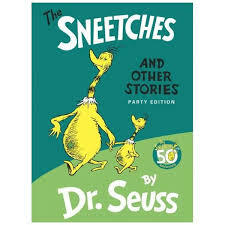 They compared the similar experience of the sneetches and Sarah Roberts, that these characters weren’t doing anything wrong. We should treat others the way that we want to be treated. We were so impressed by the Roberts’ bravery and inspired by the words, No more. Now, right now, it is time for change! that students decided to write letters to President Obama about something in their own communities they wanted to change. What a powerful lesson! After my son took the survey, I realized how much he cares about justice. I came away with a sense of relief that he was so passionate and so clear about the subject. That’s when I understood that kids get this kind of thing more easily than adults sometimes. If you ever watch a group of kids about my son’s age, fairness and right and wrong are huge topics in every game or plan or role-playing adventure. Unless kids have been schooled to hate, if you bring up racism, they immediately grasp even the subtler and more disturbing aspects of it. The survey has opened up a dialogue in our family. A billboard that said “Blue Lives Matter” and had a police logo went up near our house shortly after A. took the survey. When he heard his stepdad and I grousing about it, we had a great conversation about why we thought saying “All lives matter” is a terrible response to the Black Lives Matter movement.